Say goodbye to the 10-year-old cheese grater Mac Pro. Not only is optical drive going bye-bye, but so is the big-box tower design that Apple rolled out way, way back in June 2003. In fact, according to the latest rumor, the 2013 Mac Pro will be very much like the current Mac mini — are you ready to go modular? Rumors that Apple’s pro desktop design will be modular have been around for months if not years. That plot line gained fresh legs. — It will be heavily reliant on Thunderbolt. — There will be no internal expandability. — It will have support for Dual GPU’s with three monitor support right out of the box. Assuming Borell’s sources are right, Apple’s recent Mac Pro stock drawdown doesn’t indicate the imminent arrival of a new pro desktop, which would be disappointing. That said, perhaps the more important question then is what kind of Thunderbolt enclosure(s) Apple plans to offer and what options will be available. 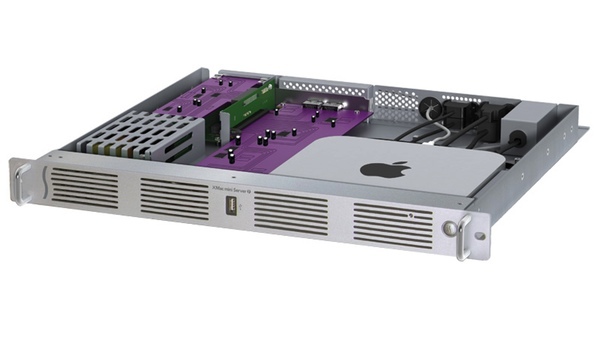 For example, there are third-party rackmount enclosures for the Mac mini (image above) with two PCIe slots that fit the above description. Further, there are external, more modular solutions that deliver a pair of open PCIe slots, as well. For what it’s worth, I expect Apple to offer an external solution that stacks and/or mates nicely with their new Mac Pro mini.